Oh, Ranger! 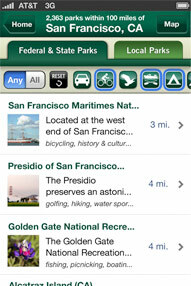 ParkFinder Mobile App | Oh, Ranger! 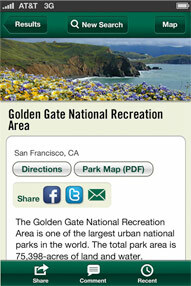 Find the parks nearest you with the activities you want to do. Our writers and editors have compiled a comprehensive database of every federal and state park in America. Included in our exclusive database are thousands of national parks, state parks, national forests, wildlife refuges, BLM sites, US Army Corps recreation areas and many more public lands. Each location contains information on the available activities, so you can search for the park nearest you with the activities in which you’d like to participate. 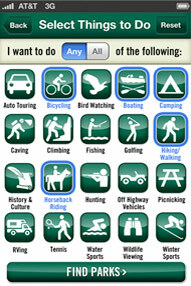 Choose from 20 different activity categories to find the right place for you and your friends and family. Want to go hiking, bird watching and boating? Oh, Ranger! ParkFinderTM has the answer! How about hunting, fishing and off highway driving? We have that too. Oh, Ranger! ParkFinder makes it easy to find great places for a scenic drives, to discover historic sites, go camping and so much more. You can also quickly toggle back and forth to find locations that have any of your desired activities or all of them. Need directions, important phone numbers, related websites? Oh, Ranger! ParkFinder has that too. Oh, Ranger! ParkFinder, which will allow users to keep track of all their favorite places and share them with millions of others park-lovers. Oh, Ranger! 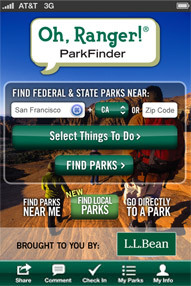 ParkFinder is available on OhRanger.com. Click here for help using the Oh, Ranger! ParkFinder app. Submitted by dahlw on August 11, 2011 - 4:47pm. Please release this as an Android app! Submitted by Ask_Kelly on August 12, 2011 - 8:49am. Thanks for reaching out to us! We're working to develop this app for multiple platforms. In the meantime, the functionality of the app is available on our website. 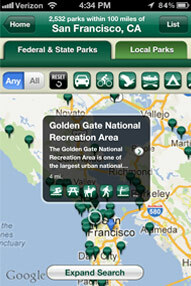 You can use the "Find A Nearby Adventure" tool on OhRanger.com, to search for nearby activities using our database of parks and public lands. We're also working on a mobile optimized version of our website (just the ParkFinder functionality), so that it'll work on any smart phone. We hope this will be helpful in the interim. Thanks again for your feedback -- we really appreciate it! Submitted by Ask_Kelly on May 17, 2012 - 11:31am. Great news: We've launched Oh, Ranger! 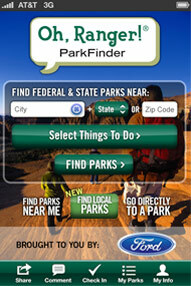 ParkFinder™ for Android. It's available now available for free at Google Play. Submitted by GoIntoTheWild on June 22, 2011 - 6:58pm. As someone who goes camping and hiking very often, I found this app awesome. I learned of a few campgrounds near my area that I knew nothing about. I also recommended it to my readers on gointothewild.com. They are sure to get as much value out of it as I have. Thanks! Submitted by alsaf on March 13, 2011 - 7:58pm. Very nice to see an opportunity to quickly identify diverse activities by park location. Excellent idea! !